Given that we were booked for the 5:30 p.m. seating, the Wommer and I knew that we would be be done with dinner at Sukiyabashi Jiro (すきやばし 次郎) very, very early. He suggested that we could do a second round of food, but I thought it would be a much better idea to go back to my favorite izakaya in the world. After walking around Ginza a little shopping for sake, we hopped back on the subway to continue our evening's adventures. Once through the doors at Tamanegiya (酒たまねぎや) I came upon an unfamiliar sight. There was a woman next to Master behind the bar, who looked much younger. Who is she? Is she the assistant, his daughter, or his wife? Master also brought us a plate of tomatoes from Ibaraki (茨城), much like the ones he served me last time. Incredibly delicious, and once you bite into one... you find yourself unable to stop. In terms of sake, what I wanted to do was to try out ones I didn't taste from my last visit 4 years ago, so that I can broaden my knowledge. 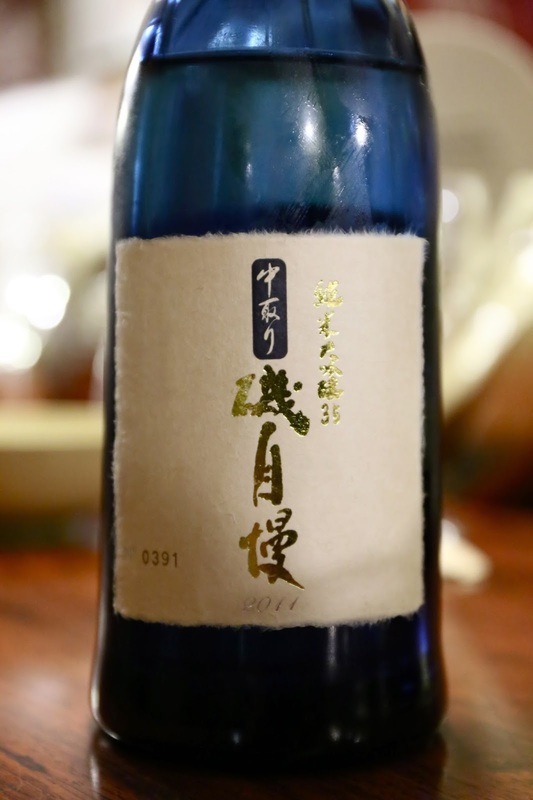 Azumaichi Junmai Daiginjo Shizuku Shibori (東一 純米大吟醸 雫搾り), 24BY - this isn't something that is made every year, and the bottles are marked with the BY and even the tobin (斗瓶) number. 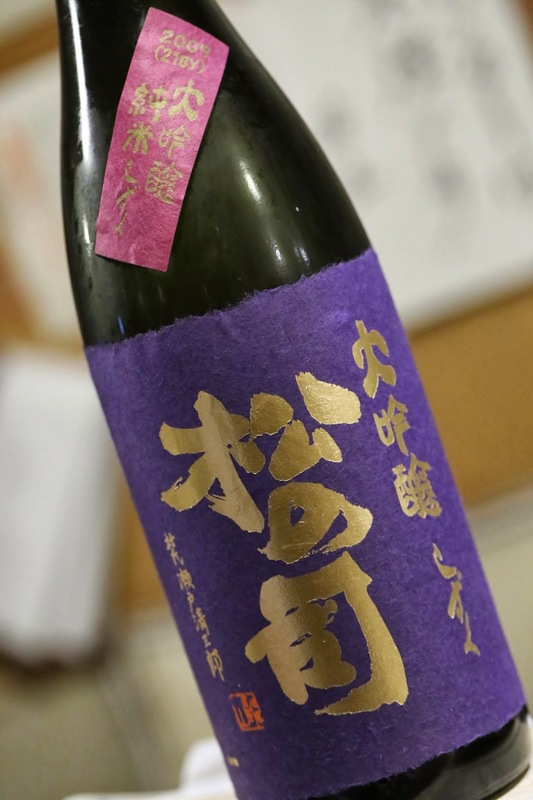 Master says they only produced 10 isshobins (一升瓶) of this sake, and since 1 tobin holds exactly 10 isshobins worth, I wonder if all 10 isshobins all came from the same tobin... Anyway, this was smooth and sweet on the palate at first, with a long and dry finish. On the palate it was noticeably thick and viscous. Matsu no Tsukasa Junmai Daiginjo Shizuku (松の司 純米大吟醸 雫搾り), 21BY - more prominent banana in the nose. Lighter on the palate, cleaner. A group of customers left early, and we were able to move to the bar and enjoy more interaction with Master. Hooray!!! 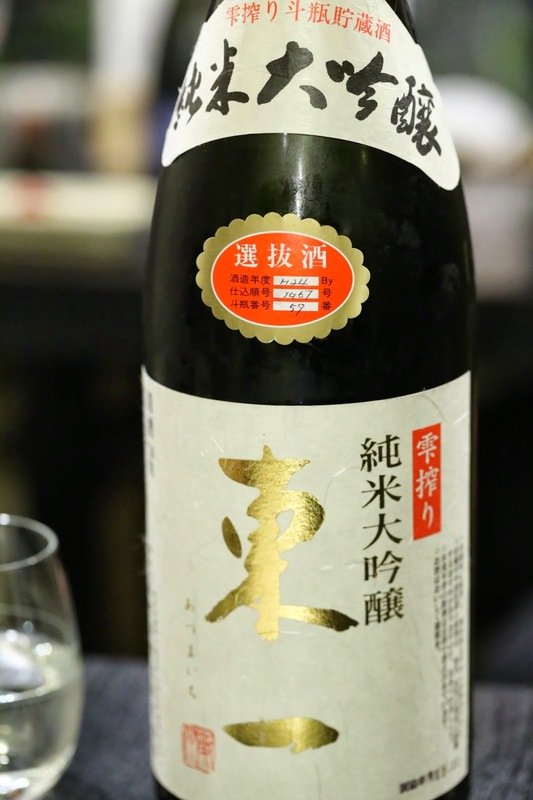 Hatsukame Show Special (初亀 鑑評会出品酒), 24BY - I had this on my last visit, but from 21BY. This was just too special to pass up, since Master bought all the bottles released (34 in this instance), as he does every year... and one simply can't have this anywhere else. 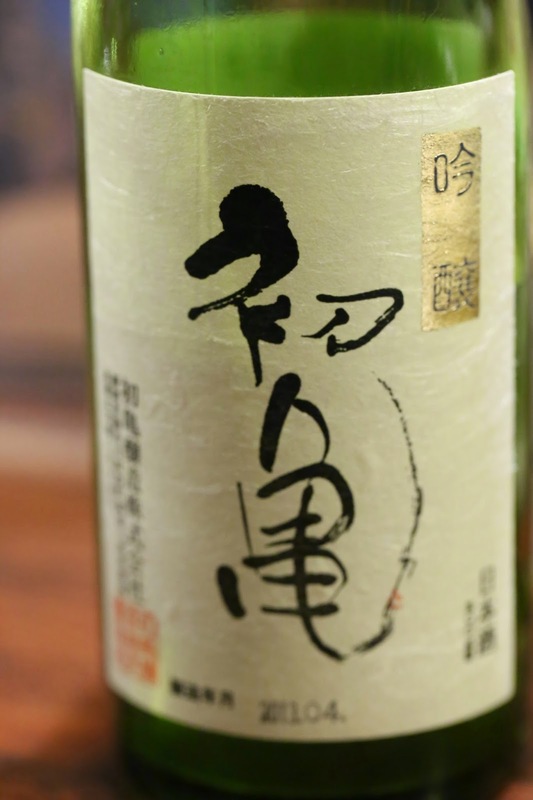 A daiginjo nama sake (大吟醸生酒). What a beautiful and elegant wine! Smooth, builds on the palate slowly, with a long finish. Rich rice flavors. More full-bodied and slightly sharp and alcoholic later. Shredded cuttlefish with ink - a great snack to go along with sake. Then I decided to do something that I can't do anywhere else... which, after all, is the whole point of coming to Tamanegiya. I decided to do a small vertical of a very exclusive sake - Isojiman Nakatori 35 (磯自慢 中取り 35). 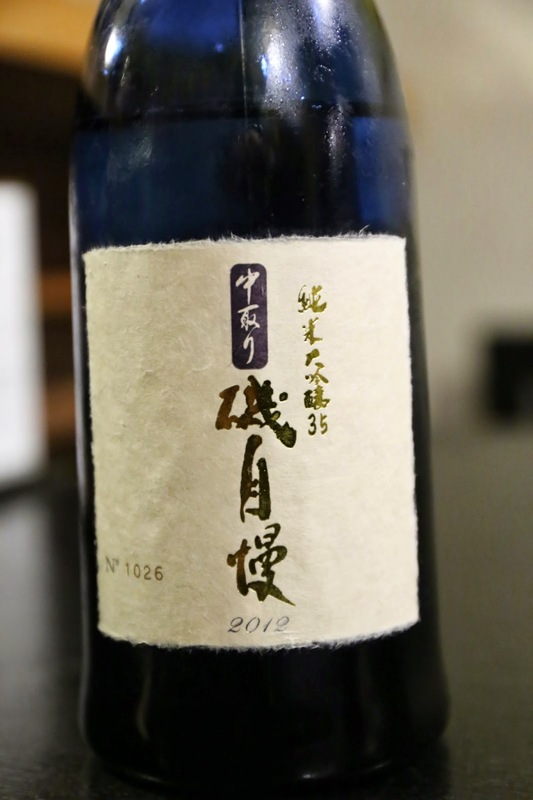 Isojiman Junmai Daiginjo Nakatori 35 (磯自慢 純米大吟醸 中取り 35), 22BY - pretty smooth first sip, fragrant with banana notes. 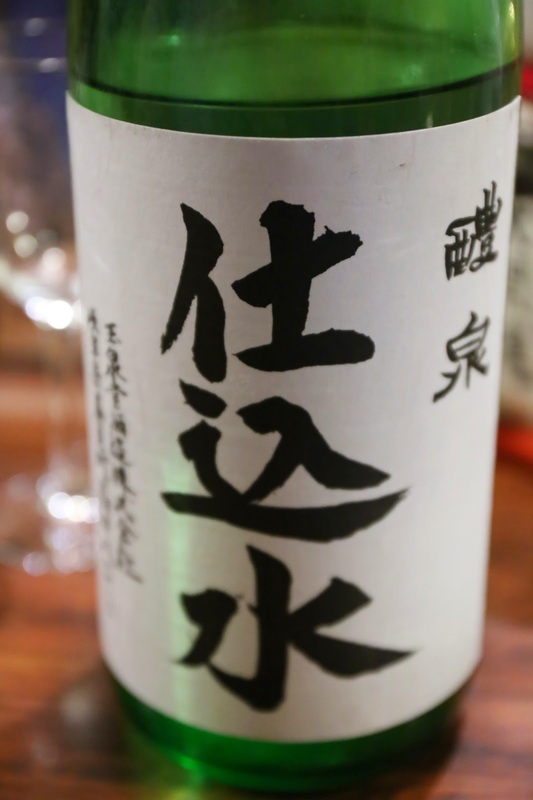 Isojiman Junmai Daiginjo Nakatori 35 (磯自慢 純米大吟醸 中取り 35), 23BY - could it be a little smoother than 22BY?! Softer on the palate, quite sweet. Later on as it warmed up, got a little stronger and full-bodied on the palate, and a bitter finish. 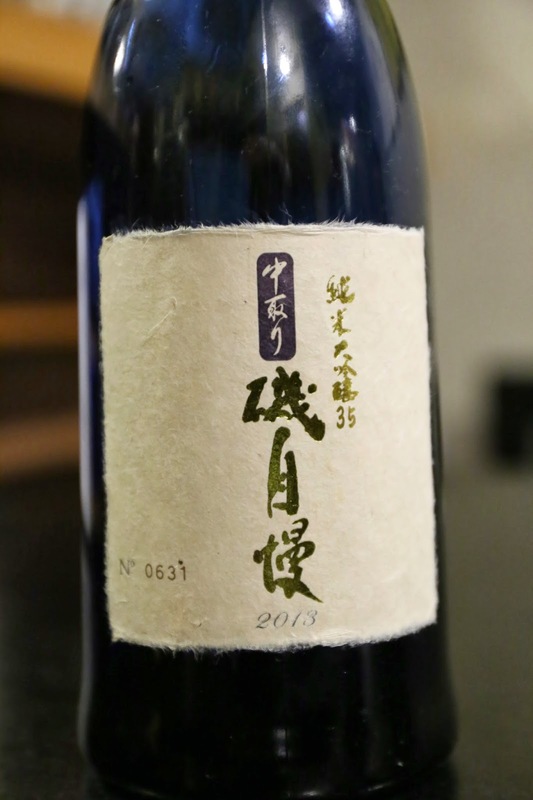 Isojiman Junmai Daiginjo Nakatori 35 (磯自慢 純米大吟醸 中取り 35), 24BY - full-bodied and round on the palate. 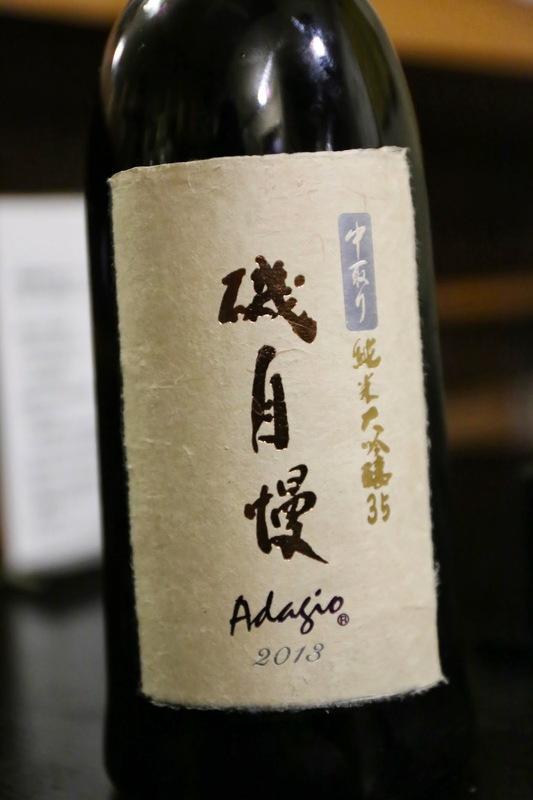 Isojiman Junmai Daiginjo Nakatori 35 Adagio (磯自慢 純米大吟醸 中取り 35 アダージョ), 24BY - the rarest of the offerings from the Isojiman stable. Really soft and elegant. Fragrant with banana and tropical fruit notes. Master prefers for us to drink tap water, as he feels that the tap water in Japan is not only potable but among the best in the world. However, he does get sent bottles of water from Yoronotaki (養老の滝) that Reisen (醴泉) uses to make their sake, so it shows up on the menu. I loved the purity of it so much from my last visit that I asked to drink it again. Bijofu Yuzu Liqueur (美丈夫ゆずリキュール) - I actually wanted to start with this, but Master stopped me as the acidity will ruin my tastebuds for the rest of the evening. So at the end of the evening, even though I knew I was already drunk, I insisted on having a glance over crushed ice. I absolutely loved this from my last visit, and in fact bought about a case of it to take back home. Tonight Master poured it from an isshobin and used a Champagne flute to serve it. The citrusy flavors of this liqueur are always so incredible. If Master had chosen to do business in a place like Ginza, with lots of traffic from well-heeled customers, then it is quite likely that a significant portion of his customers - if not the majority - would consist of people who don't know much about sake, who have money, and are simply there to drink expensive sake for the sake of drinking something expensive. These people may be able to afford it, but they are not sake lovers and won't fully appreciate what they are drinking. In the present hideaway location, any customer who comes through the door has got to be someone who really loves sake, because it takes some effort to even find this place on a map. The patron sitting next to me wondered how we even found out about this place since we were tourists. All the customers here have made a special trip, much like Michelin's definition of a 3-star restaurant, so by definition he/she must be a sake lover. This is the type of customer that Master would prefer to serve his rare collection to. As I noted last time, the most impressive part of Master's collection is actually not his sake, but his collection of rare Madeiras. I noticed a very special bottle last time, and the bottle was still in the same fridge tonight. I asked Master to verify the maker, and after he unwrapped the mylar bag around the bottle, I had visual confirmation that it is indeed the 1795 Barbeito Terrantez. According to Master 6 bottles of this were imported into Japan, but he didn't tell me if he had more than 1 bottle... Of all the alcohol that is physically present in this establishment, there is nothing I would like to drink more than this particular bottle. I wonder what it would take for Master to open it with me... but I'm sure it involves me coming back to see him quite a few more times! For someone who owns a tiny little izakaya seemingly in the middle of nowhere, Master is not just super connected with the Japanese sake kuras but also has a real worldly view. Among his blog posts is an entry on white wine, where they tasted 6 different whites from Sine Qua Non. Upon realizing that we were coming from Hong Kong, Master mentioned that he knew the late Kinsen Kam from Yung Kee (鏞記), who took personal care of him on his visits to Hong Kong. He may be a short and unassuming guy with a crew cut, who wears a T-shirt printed with the words that mean "low-income earner", but Master has a lot more depth than he chooses to show.